It’s time for a large Star Wars™: Force Arena update and this time we are bringing new factions, new cards, new modes and more! This update promises to be a large one, so make sure to check out the details below and learn more about version 2.2! ■New Era, New Units, New Playstyles! A new era of the Star Wars era has being added. We are adding the First Order and the Resistance to the game, bringing the total factions up to 6! Light Side will be divided into Galactic Republic, Rebel Alliance and Resistance. Dark Side will be divided into Separatist, Galactic Empire and the First Order. 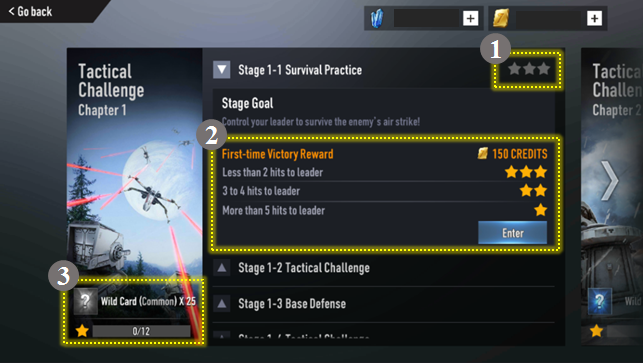 Check out the all new era bonuses for the First Order and the Resistance! Of course, we couldn’t bring you some new Era’s without populating them with cards! The first of the new leaders and Units are listed below! Rey’s mysterious circumstances are rivaled only by her connection to the force. Originally believed to be nothing more than a simple scavenger, Rey has shown that she has an incredible connection to the Force, and under the tutelage of Luke Skywalker, will continue to hone her powers and possibly become the greatest force wielder the galaxy has ever known. ▶ Deftly uses her lightsaber to take down her enemies. ▶ ’Mind Trick’ skill can be used to turn enemy units into friendly units. 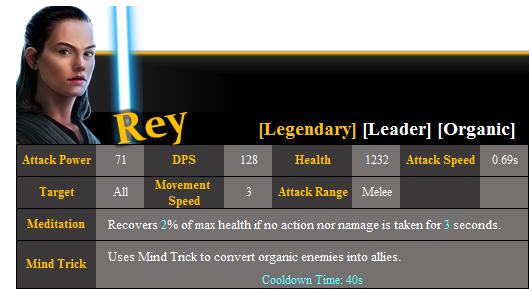 ▶ ’Meditation’ allows Rey to heal for a certain amount of HP if she does not do anything for a set period of time. ▶ Can deflect blaster bolts when idle for a certain amount of time. The fastest hunk of junk in the galaxy has played a key role in some of the galaxy’s greatest battles. Originally built as a light freighter, the ship had several improvements made under Han Solo’s watchful eyes. With Chewbacca at the controls, the Millennium Falcon is more powerful than it has ever been before. ▶ The Millennium Falcon bombards the field with a powerful laser cannon. Tarsunt Resistance Grenadiers are the strongest of all the resistance fighters. With impressive arm strength most fitting of their towering statures, they throw hand grenades that deal immense damage to enemies. ▶ Grenades thrown will deal damage to Organic units, and Stun Tech units and turrets. Medics are one of the most valuable resources available for an army at war. The Resistance medics are highly trained professionals who put their own lives on the line to help the resistance overcome the First Order. ▶ Deploys one medic who will heal injured units on the battlefield. 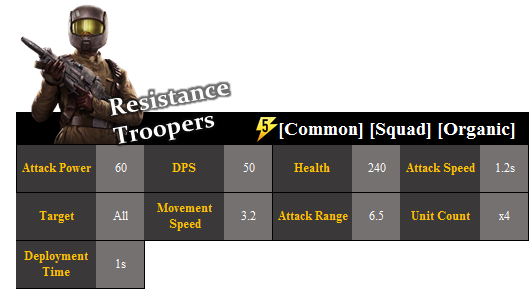 The well-trained and well-equipped Resistance Troopers are the most basic of the Resistance forces. 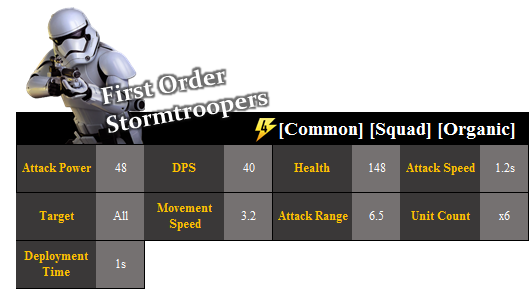 Well-versed in guerilla tactics, they are optimized to fight against the dominating First Order. 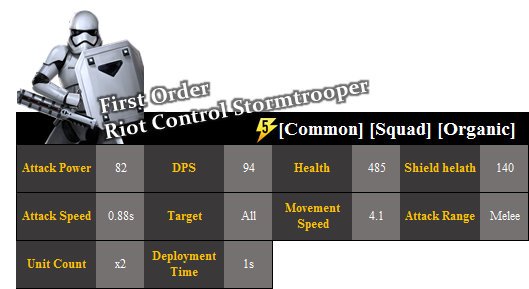 ▶ Deploys 4 Resistance troopers when deployed. Built by Incom-FreiTek, T-70 X-Wings are the primary Starfighters of the New Republic Starfleet and a poignant symbol of the Resistance. Faster and more powerful than its predecessors, the Resistance X-Wing boasts immense firepower than can bring the First Order down to its knees. ▶ Causes great damage to units which are caught in their laser cannons. Once known as Ben Solo, Leia and Han Solo’s only son, Kylo Ren heard the call of his grandfather and devoted himself to the dark side of the Force. As one of the leaders of the First Order, and the apprentice of Supreme Leader Snoke, he ignites his fiery lightsaber to strike fear into the hearts of the Resistance forces, and to bring down the legacy of the Jedi. 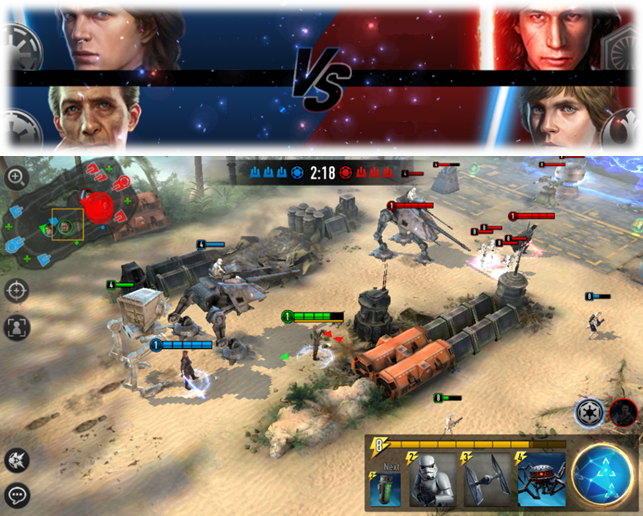 ▶ Defeats enemies that dare stand to confront him with his lightsaber. ▶ Using the Force, Kylo Ren can deal damage to his foes and render them immobile for a certain amount of time. 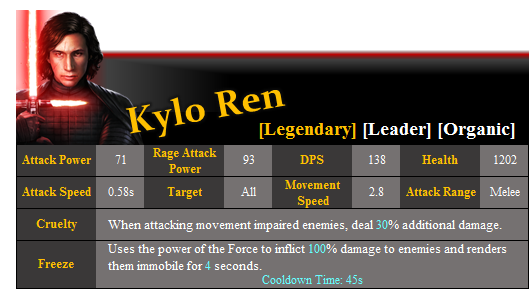 ▶Kylo Ren’s passive skill Cruelty, allows him to deal more damage to impaired enemies. Letting the dark side of the Force feed on his rage, Focussed Rage allows Kylo Ren to zero in on his targets, shrugging off everything the resistance can throw at him. 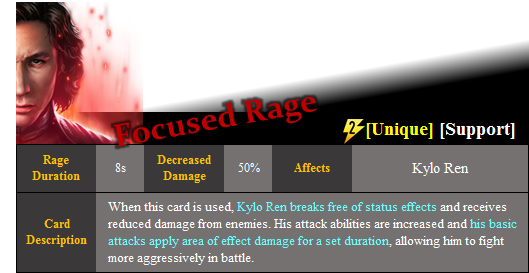 ▶When used, Focussed Rage allows Kylo Ren to remove all status effects. ▶As Kylo Ren’s rage is focussed, he deals damage in a wide area of attack whilst increasing damage and reducing incoming damage. The vast improvements of the First Order’s SF TIE Fighters make them an incredibly powerful ship. However the ship does come with a particularly large downside. Due to the new complexity of the controls, the SF TIE fighter requires two Elite Pilots to control. The increase in firepower is also notable, with the new mag-pulse warhead launcher, making these fighters a great choice for everything from recon missions to space warfare. 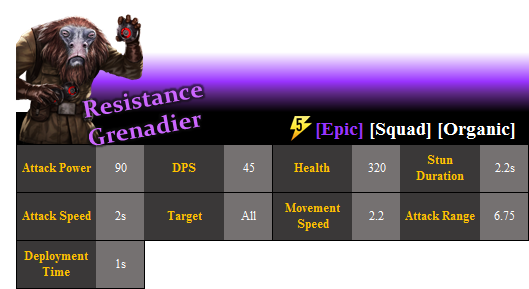 ▶ Drops powerful mag-pulse bombs on the battlefield. ▶ Mag-pulse bombs stun mechanical units and paralyses defensive structures. The First Order Flametroopers use D-93 Incinerators to melt through enemy troops and fortifications. The Flame-proof armor and helmets help protect them from the hellish inferno that they cause. 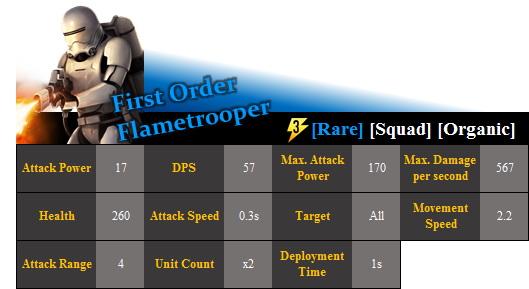 ▶ Summons two First Order Flametroopers to the field. ▶ Flamethrowers deal continuous fire damage to nearby enemies. ▶ The longer an enemy withstands the fire, the more damage they will take. First Order Stromtroopers are trained to fight from the moment they are born. Given Serial numbers in lieu of names removes their individuality, creating loyal and hardy troops for the First Order. Their unquestionable loyalty to the First Order makes them incredibly deadly, as restraint is not in their vocabulary. ▶ When deployed, 6 First Order Stormtroopers drop into the battlefield, using their blaster rifles to attack enemies. The First Order Riot Control Stormtroopers receive tactical training to maintain order on occupied planets. They swiftly bring order during riots using their Z6 riot control batons. ▶ First Order riot control Stormtroopers use their batons to subdue the resistance. ▶ Will not receive damage until their shields have been broken. 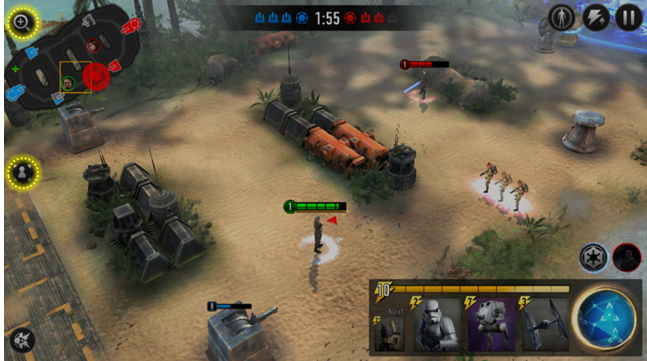 Star Wars™: Force Arena is a tense battle between commanders. But all that tension can be exhausting, and sometimes you just need to kick back and relax, or practice some skills in order to improve in a non-competitive environment. Well this new mode is probably for you then! We have created a set of tactical challenges that will test your survival, your tactics and your base defense. Of course, these modes would be useless without some kind of a reward, and as you progress through the challenges you will receive plenty of rewards, including the reward of getting better at the game. 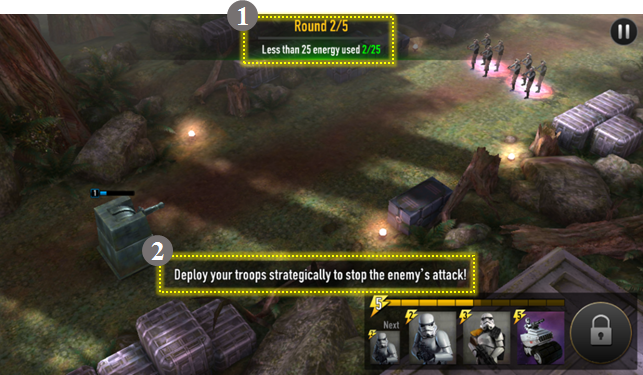 Tactical training can be found through the Single Play section in the bottom right of the main screen. Single play is divided into two sections. 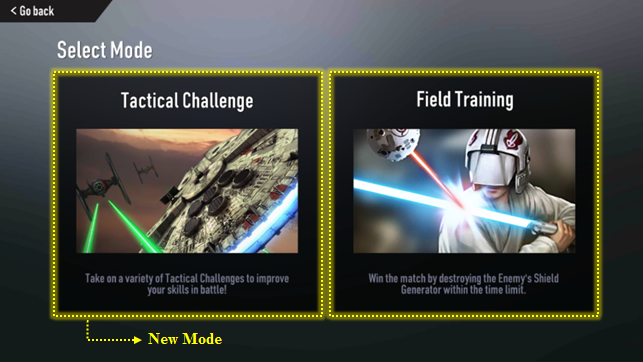 Field Training (the training mode already in the game) and the Tactical Challenge which is the new mode. The tactical training mode consists of different chapters, and each chapter must be cleared before the next one can be attempted. 3) the amount of stars required to get the reward. 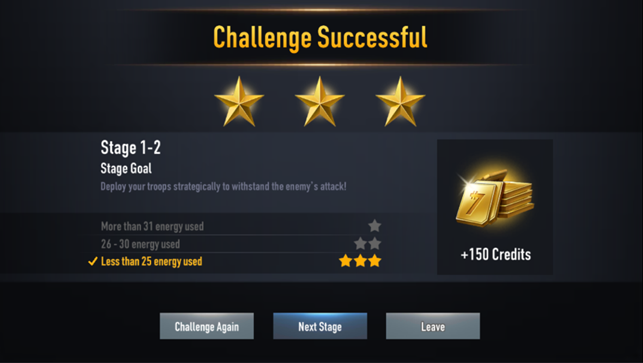 Each stage has different conditions needed and you will be rewarded a different amount of stars depending on how well you have managed to complete the stage. 1) Current Round and Conditions that you need to complete the ongoing stage. Once you complete a stage, you will be shown a results screen which will show you how you managed to do, the rewards that are given to you, and then three buttons to navigate to the menu screen. 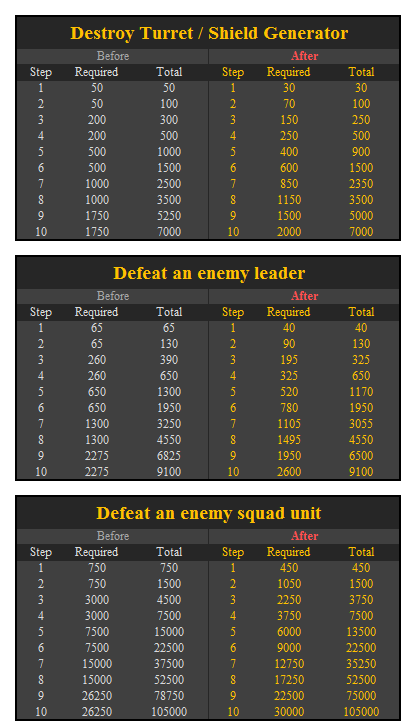 Many squad leaders have been asking for improvements to the 2vs2 game mode. Whether it is improving matchmaking speeds, or creating a more dynamic experience, 2vs2 is a mode than many players care deeply about. We are making some adjustments to 2vs2 which will allow light and dark side players to join forces, creating varied and unique gameplay experiences within the 2vs2 mode. 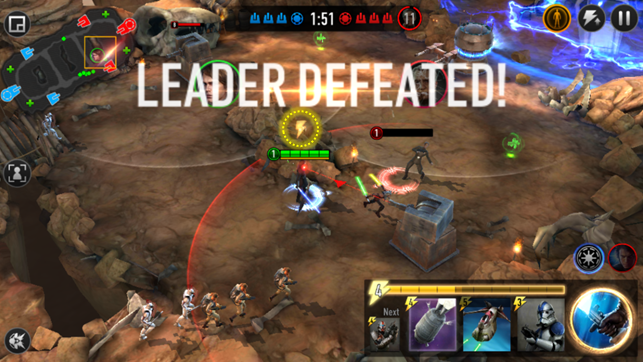 Whether you want to match Luke Skywalker and Darth Vader together, or play Kylo Ren and Rey on the same team, it is all possible! New tactics and new strategies will take to the 2vs2 arena in this update. -A battle will not feature more than one of each character. This update we are going to be reworking the way that being defeated works in the game. Currently, the only punishment for having your leader be defeated is the time it takes to respawn. Sometimes this can really turn the tide of battle, as 10 seconds of being inactive on the battlefield can really have an effect. Other times you are back up before you know it. When a leader is defeated after this update, the other leader will gain extra energy as a result. Over the course of a battle, this energy can really start to stack up, giving a significant advantage to the player who doesn’t get defeated in battle. -The leader who will gain the energy must have hit the opposing leader within a certain amount of time before the death. -This applies to all modes in the game. -Bossk will gain two energy when his passive is available. Changes are being made to the camera in this update. We have heard players’ cries for a free camera, and not one that snaps back to the leaders all the time. So the new free look camera has been added, allowing you to position the camera where ever you like. By pressing the free look button, you can control the camera by dragging your finger around the screen. We have also added a 3rd camera angle, allowing players to play with a more zoomed out camera. This mode is great for seeing more of the battlefield, however it may come at the cost of losing some of the accuracy needed for precise movements. 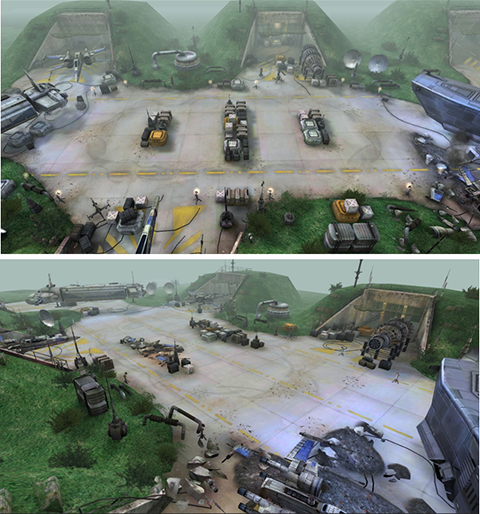 A new map has been added to the rotation, with the Resistance base D’Qar being added to both the 1vs1 and 2vs2 map pools! Check out the stills below! 1. When you win a game and obtain a victory pack, the victory pack will contain cards which are the same as the side that you won with. Ex) If you win with a Dark Side deck, the victory pack will contain Dark Side only cards. If you win with a Light Side deck, the victory pack will contain Light Side only cards. Free packs will give you now give you cards corresponding to your highest level faction. Note:Card packs obtained before the update remain unchanged. Guild mission objectives have been modified to make it slightly easier to get to stage 9. We have also modified the contents of the guild mission packs. We are tweaking the amount of points that are won and lost between ranks 1~11. The rapid acceleration of players meant that they were facing stronger and stronger players too early. New faction missions have been added. Some elements of the UI have been changed. Improved card reaction speed and movement. New Filters have been added to the Deck Screen and Training Mode Screen, allowing you to filter by era. The video recording function has been removed. Unit detail icon has been added. In the store, card packs are now sold separately by faction. Gold pack sales in the store have been removed. 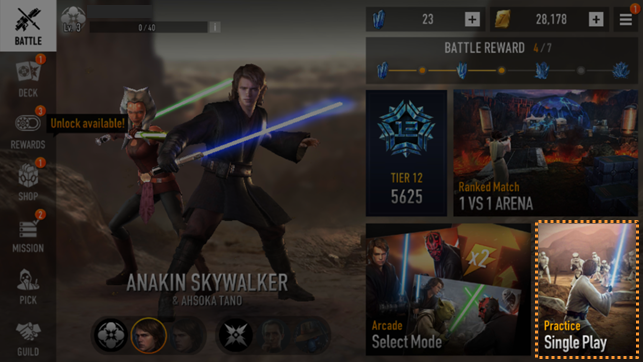 New/Returning user attendance rewards changed from Darth Maul/Yoda to Rey/Kylo Ren. Credits gained from winning matches has been modified. Card descriptions have been added for draft mode. Fixed an issue where deploying some units could cause errors. Fixed an issue where the GNK droid explosion damage is canceled when the GNK droid is under a status effect. Fixed an issue where Luke Skywalker count not move after respawning. Fixed an issue with the placement time of the ID9 Seeker Droid and the Dewback Rider displaying incorrectly in the card information window.